Published Bestsellers: The King’s Ransom: Brilliantly written with twist, turns and excitement. Highly recommended! The King’s Ransom: Brilliantly written with twist, turns and excitement. Highly recommended! 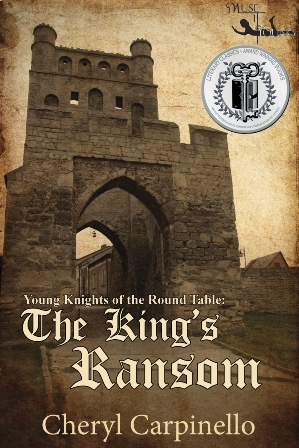 Set in medieval England, The King’s Ransom is crammed with complex but brilliant characters who will keep you engrossed and reading till the end. Each of the characters has their unique perspectives on the events that occur and in a fascinating way the author gives an insight into what they're thinking. The writing is lucid and description so deft it puts you in touch with the characters–you can feel the emotions–you really feel you are at Penbroke Castle! The author doesn’t beat around the bush as the reader is thrust straight into the action from the onset. This is then followed up flawlessly with a mystery and a quest for the young boys. The boys receive fortunes which help them with their quest, and it all culminates in an exciting grand finale. Overall, a brilliantly written book with twist, turns and excitement. Highly recommended! In medieval Wales, eleven-year-old Prince Gavin, thirteen-year-old orphan Philip, and fifteen-year-old blacksmith's apprentice Bryan are brought together in friendship by one they call the Wild Man. When an advisor to the king is killed and a jewelled medallion is stolen from the king’s treasury, the Wild Man is accused of the theft and murder. Filled with disbelief at the arrest of the Wild Man, the three friends embark upon a knight’s quest to save their friend’s life. To succeed, the three must confront their fears and insecurities, and one of them will have to disclose the biggest secret of all. Join Gavin, Philip, and Bryan on their quest and share the adventures that await them in the land of King Arthur and his Knights of the Round Table. "This was a great book! I liked all of the action and excitement in it. Ms. Carpinello wrote this book really well and it was very appropriate for kids even though it deals with fighting and a wrongfully accused person. Ms. Carpinello described the time period really well, I felt like I was a knight in medieval times! I really love that the story features a bit of King Arthur legends in it! The ending had a couple fo great twists that had me totally surprised!." ~ Erik @ This Kid Reviews Books, 5 Stars. Thank you so much for a glowing review of Young Knights! So pleased you enjoyed it and that you took part in the Young Knights Blog Tour. I think tween boys will easily be able to identify with the main characters. You're welcome, another candid review from Joshua. Joshua, thanks so much for your review of Young Knights! I'm pleased that you enjoyed it as you are part of my targeted audience. Thanks also for sharing with your readers and for hosting me! It was a good read. Wish you all the best with your publication.